I came back from work that day, and he went out as well. I waited till 11 pm and I didn’t see him. I tried calling him on phone when I didn’t see him. He complained that I was screaming, I apologized for screaming and I asked him for his whereabouts. I told him he wouldn’t have gone that long since he wasn’t on location. All he said was that he was coming, he also said I was screaming which I apologised for again. But Femi did not come back to the house till 1am. I was up waiting since he said he was coming. When he came, I went to open the gate and I told his friend that I wouldn’t come down that late again if he comes back late. I was really upset. I asked his friend to warn him because of another time. I added that he should be telling me if he would come home or not because that wasn’t his first time. The next thing Femi said was, “You dey craze.” And I replied the same way. He started bragging, “Do you know who you are talking to? 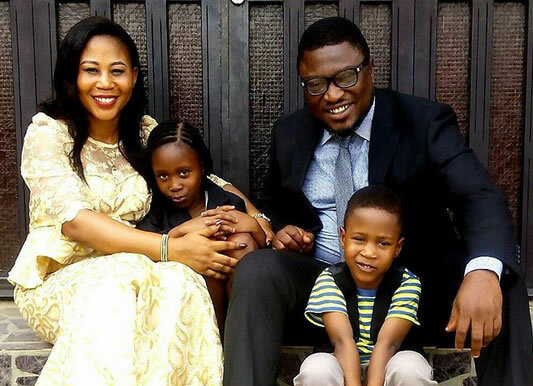 I am Femi Branch,” and he descended on me and started beating me. He was hitting me hard and his friend was trying to stop him. He left me and went upstairs and told me to meet him upstairs. His friend said I shouldn’t go, but where will I go by that time? So I went upstairs. Femi continued beating me and insulting me. His friend tried to intervene again, all these while I never raised my hands against him. You can imagine him with his stature hitting me. His friend said I shouldn’t sleep in the house, so I followed him because he was also a married man with a kid. I slept in his house that night. I wouldn’t want to drag him into this, it was a close friend of his. The truth is, that was the first time. But before then, he had pushed me hard against the bed that I almost hit my head on the wall. That was two years ago. Such things don’t happen without signs, him pushing me the first time and now beating me. It could develop into something else. I have always said I can’t stay in a marriage if the man is beating me, I know I can get killed if it continues. I have risked my life enough in that marriage so I decided to leave. The second day, his younger brother asked me to come over to his own house as he wasn’t happy I was staying in a friend’s house. I moved there and was shuttling between that place and my sister’s house till I could get a place of my own. The issue is that we women see signs even before marriage. I would like to say that Femi came extremely late on our wedding day. People were already waiting for almost three hours before Femi came and he was not apologetic about it? I don’t know, but it took him almost three hours before he showed up and he was not remorseful about it. Then, when I got married to him, he has only paid my daughter’s school fees for just one term. My daughter is nine years, that means I am the one who has been responsible for her upkeep. He made me believe he does not have money. Later on, I heard he goes out and spends money anyhow. He goes to clubs, pops champagne and spends crazily. It was a regular occurrence, people used to call me that he was in one hotel or the other. There was this particular day someone called me that he was in a hotel spending money. That person knew Femi was not responsible at home. All I was trying to do was to patch the marriage and make sure things were fine. You know in the African setting when you are married, you have to endure. Up till this moment that I am talking to you, he doesn’t know how his children are eating or faring. The last time he saw them was January this year. He said they should spend the New Year with him and he returned them empty handed. Several times, we spoke severally. He was always saying jobs were not coming, he doesn’t have money. It is unfortunate outsiders have a different picture of him. Femi is someone who can be in church speaking in tongues and the next minute he is out with the guys drinking, smoking and womanizing. He acts a lot. He is not the same person at home and outside. Funny enough, he has a very wonderful family. They knew about it and spoke with him severally. In fact, his family made me stay this long in the marriage. His family complained and talked to him, they did everything they could. It is only prayer that can change him, Femi lies a lot. He would tell me he has gone on location and he would lodge in a hotel, do whatever he likes. There was a time he was part of the crew following Jimi Agbaje during his campaign period. I was in Abeokuta then. After the whole exercise, everybody left the hotel except Femi. He was enjoying himself. One of his colleagues whom I had complained to called me to inform me that he was the only one left in the hotel. It is the same hotel he is indebted to now. He has a case at the Ikeja magistrate court. The story is true that he was locked up in Kirikiri. He is owing the hotel to the tune of millions. I asked, spoke with him and he would always give excuses. It is what Femi wants that he will do. It took him eight months before he came home. When he was arrested, I was in Abeokuta and he was in Lagos. I traveled to Lagos that night to bail him out but I couldn’t bail him that night. That was in November 2015. I did all these for Femi but to him I have done nothing. I told you Femi lies a lot. Ask him to produce his certificate. He has lied so much and he will continue to lie, that was what he told me. Yes, he was married before we met. According to what I heard, the lady didn’t stay up to a month. I was told a funny story about it, I was told the mother in law was to collect cow leg and the lady left. I think they were to share a cow and she wanted a particular part of the cow. I dont really know, that was what I was told. Maybe the lady noticed something else. If I have the opportunity to meet her I would ask her. My parents didn’t believe the story as well, we just let things be. Yes, I have. I was just laughing, and I said, Wow, Femi has caught a big fish. According to what I heard, the lady is British. I said Femi has caught a big one. I am not saying that but before I married him, I do travel out a lot for leisure. When we got talking, he had the idea of the type of life l lived before meeting him. Maybe he felt I had money or that I had a British citizenship. I was even pregnant before we got married but the baby was still birth. Immediately it happened, I traveled abroad to rest. Good for the lady, I pray they find happiness together. But there must be more to why Femi wants to marry that lady. I am not granting this interview because I am bitter, I have moved on. I just want to clear my conscience because my family didn’t know what I went through for ten years. It was when I left last year that I told my family. People have called to blame me, some said I should go back to him.